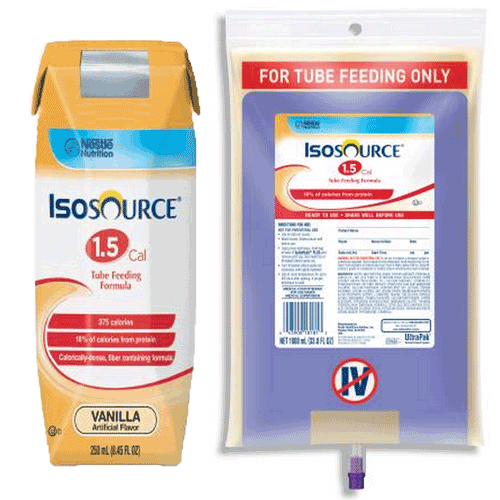 Isosource 1.5 Cal Tube Feeding Formula is a high-calorie, high-nitrogen, complete liquid formula with fiber. 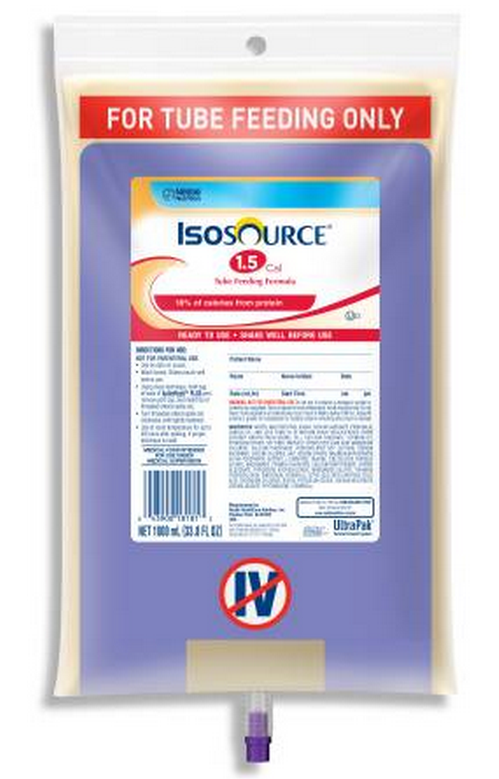 Provided in closed system containers, Isosource 1.5 Cal offers microbial protection. 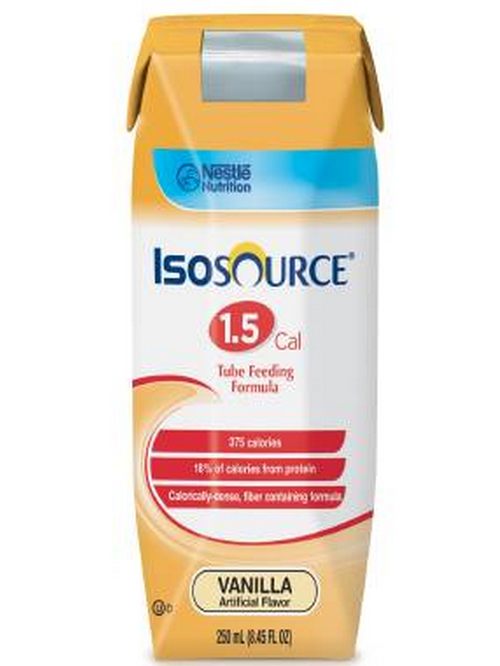 Isosource 1.5 Cal is designed for short- and long-term feeding in patients with high caloric and protein needs and/or limited volume tolerance. Isosource 1.5 is lactose free, gluten free and kosher. Isosource 1.5 is not for individuals with galactosemia. Available in 250 mL and in 1000 mL SpikeRight® PLUS UltraPak® Bags, Isosource 1.5 Cal supports digestive health and normal bowel function. Isosource 1.5 Calformula is a Medical Food.Consumers should consult with their physician on the use of this product. May be suitable for a gluten free diet . Isosource 1.5 Tube Feeding Formula Product Numbers: 18180100, 18182000, 181500. Flavor Options: Unflavored or Vanilla. Size: 250 mL or 1000 mL. Protein Source: sodium and calcium caseinates (milk). Osmolality (mOsm/kg water) Vanilla 485, Unflavored 650. Packaging: Carton - Tetra Prisma® or SpikeRight® PLUS UltraPak® Bag. Elevated caloric and protein needs. 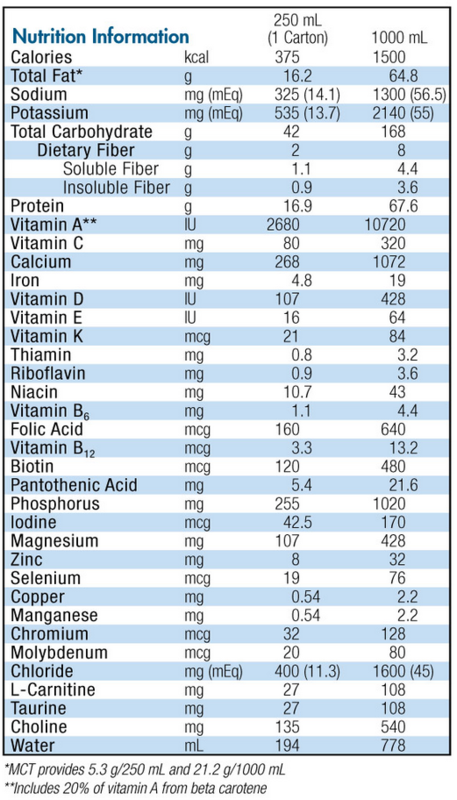 Water, Maltodextrin, Sugar, Sodium Caseinate (from Milk), Canola Oil, and less than 2% of Medium Chain Triglycerides (from Coconut and/or Palm Kernel Oil), Calcium Caseinate, Soybean Oil, Potassium Citrate, Soy Fiber, Partially Hydrolyzed Guar Gum♦, Magnesium Chloride, Calcium Phosphate, Hydroxylated Soy Lecithin, Sodium Ascorbate, Choline Chloride, Salt, Sodium Citrate, Magnesium Phosphate, Alpha-Tocopheryl Acetate, L-Carnitine, Taurine, Zinc Sulfate, Ferrous Sulfate, Niacinamide, Vitamin A Palmitate, Calcium Pantothenate, Copper Gluconate, Pyridoxine Hydrochloride, Manganese Sulfate, Thiamine Hydrochloride, Riboflavin, Vitamin D3, Citric Acid, Beta Carotene, Folic Acid, Chromium Chloride, Biotin, Potassium Iodide, Sodium Molybdate, Sodium Selenite, Phytonadione, Vitamin B12.